Assistance with a custom Client Applications or Special Projects may need to be coordinated with other campus offices such as the Finance Office or the Development Office. Please understand that you need to allow enough time in advance for any custom application or project for it to be completed by your desired launch date. Requests for custom applications need to be submitted in advance through the OIT Service Desk. (allow at least 2 weeks in advance of desired launch date). Your service ticket should include information outlining the type of application you need, the date you need it completed by and all contact information. 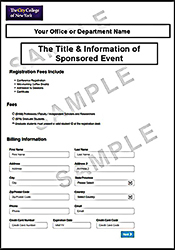 If you need a registration form or RSVP, you will need to include the contact information of a staff member who will receive all form submission data and transaction reports. If your custom application involves payments, you will need to go through proper channels in the Finance Office or work with the Development Office to set up accounts prior to the application creation. Allow enough time for the processes involved in creating and testing your custom application. Juan Baez, Director of Applications Services, to set up a meeting or submit a request through the OIT Service Desk. (allow for an open timeline until request is reviewed ).